Here comes the FlyBook, a super slim and lightweight notebook computer. Instead of Intel and AMD CPU, the FlyBook is boosted by 1Ghz Transmeta Crusoe TM-5800 processor. It sports 512MB RAM and built-in ATi Radeon Mobility graphics. There is a 40GB 2.5-inch hard drive for storage. 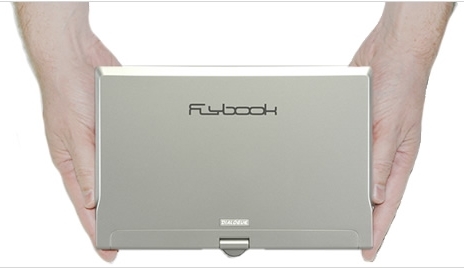 The FlyBook supports Bluetooth, WiFi as well as GPRS mobile network. You can find a VGA output, two 1394 Firewire and two PCMCIA Type-II slots for expansion. It features a flexible tablet PC design that allows users to rotate and flip the screen and operate using a touch pen. The unit measures just 235 x 155 x 31mm and weighs only 1.2kg.